Media industries took the first blows dealt by the rise of digital technology. One by one, once-tangible goods such as music CDs and video DVDs were Vaporized, replaced by pixels and bytes of data. With them went their recording and playback equipment, as cameras, personal stereos, game consoles and even televisions were collapsed into tiny handheld devices still quaintly referred to as “phones”. Now, every aspect of our economy and society is set to be reconfigured by technological forces that only a handful of increasingly powerful companies have mastered. 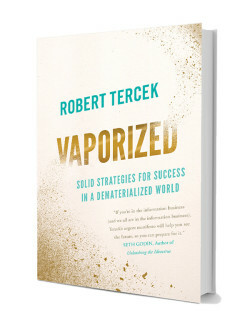 In Vaporized, digital pioneer Robert Tercek reveals the inner workings of the largest cultural and economic shift since the industrial revolution, and explains its implications for retail, finance, employment, education, and even our human identities. Dynamic and engaging, Tercek does for digital business theory what Malcolm Gladwell has done for sociology, articulating a complex, arcane subject in approachable and relevant terms. In contrast to the digital-era doomsayers and hand-wringing pundits, Tercek offers an insightful, optimistic analysis of the future and a practical blueprint for success that no business leader, from the Fortune 500 CEO to the small startup owner, can afford to ignore. Robert Tercek invents the digital future. He has launched satellite networks, the first video on mobile phones, multimedia games, and live interactive learning programs. He provides strategic insight to Turner Broadcasting, InterPublic Group, PBS and other firms. In the past he served in executive leadership at MTV, Sony Pictures and most recently as President of Digital Media at OWN: The Oprah Winfrey Network. Learn more. Robert Tercek is a technological provocateur. Rob Tercek gets the transition happening in every corner of the economy. His insights matter. Read the book. Listen to what he says. Tercek convincingly poses breakthrough concepts that are both disturbing and promising about what will come. This is the only book you need to understand how the mobile economy really works. Tercek’s vision is singular, unique and unmatched in its insight. Vaporized is the next must-have strategy guide for every executive in media, manufacturing, retail and marketing. Indispensable strategic insight about the future of media, manufacturing, marketing and retail. Vaporized will be a must-read for the next generation of business and political leaders.